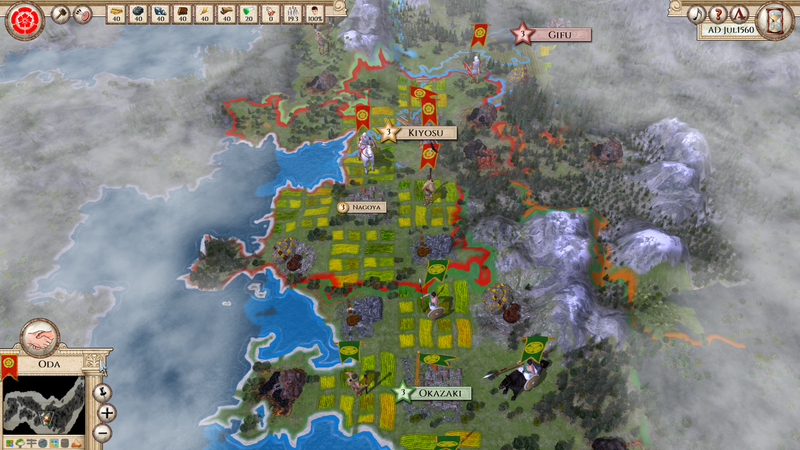 Right before Christmas, scenario creator with nickname Hiro published an ambitious scenario called "Sengoku Japan 1560". 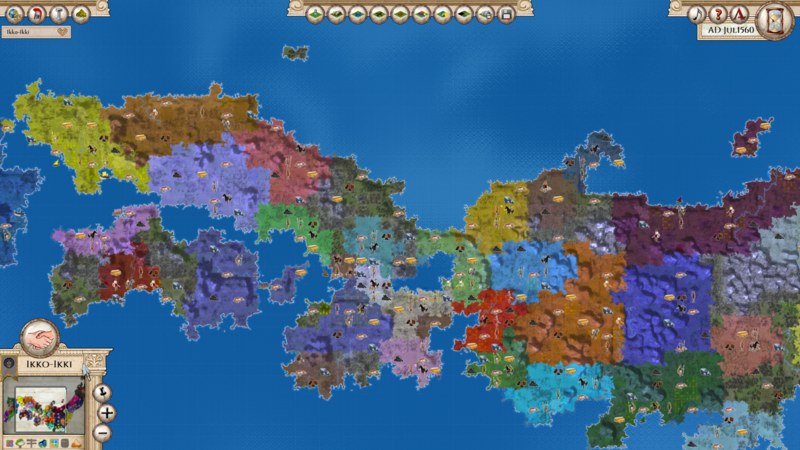 It has a big map with an impressive 38 factions and 100 villages and towns across all Japanese islands. One of the first scenarios that was uploaded to the Aggressors Steam workshop was “Ancient Orient BC1000” with its own mod “Orient”. In that time our Map Builder tool was not yet available, and the creator made his map manually. It contained Greece, Asia Minor, Egypt, and Middle Eastern territories like Syria, Assyria, Arabia, etc. The scenario was a bit of a surprise for me. The other scenario creators were pretty active on the forum and our Discord channel asking questions regarding the game editor, mod related issues, how to add new factions, and so on. The creator of “Ancient Orient BC1000” was different. He rarely asked questions on forum, and he was able to figure out most of the things on his own. That's also the reason why I was a bit sceptical about the result. I eventually had some time to try it later and I was very surprised how much Hiro, the creator, was able to handle on his own. Not only it was a nice map with a balanced setup but Hiro was able to create a set of Objectives for each player, their own banners, coat of arms, and illustrations. I was impressed, even more so that he created it almost without any help or support. Right before Christmas, Hiro published an even more ambitious scenario called "Sengoku Japan 1560". It had a much bigger map with an impressive 38 factions and 100 villages and towns across all Japanese islands. Hiro now had the Map Builder available, which made map creation easier and looking more life-like. Similar to his previous scenario, he created its own banner, coat of arms and illustration for each faction. I would like to say that it is a great work. 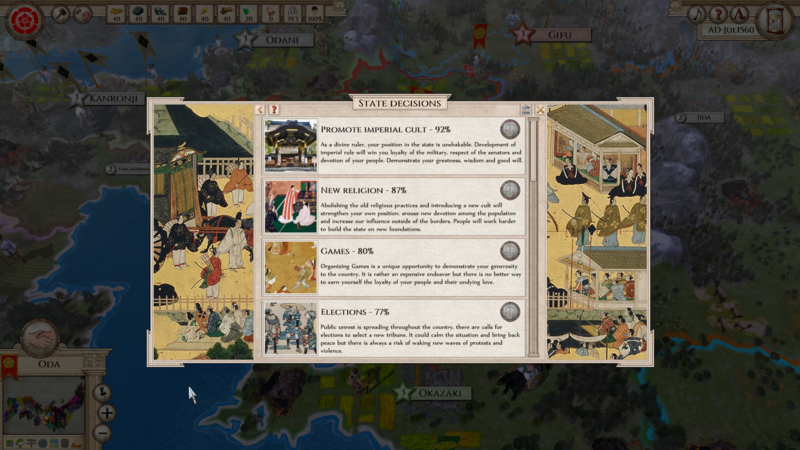 Also, all the game windows were illustrated in the spirit of mediaeval Japan, but that was not all. He went into such detail that every faction has its own names of military units and fleets, and there were also dozens of Objectives. The game also has its own Government systems. I have to humbly confess that I haven’t had time to try this great scenario yet, however you should not hesitate and give it a go. One of the signs of a good modder/scenario creator is that he keeps his work updated and reacts to players' wishes. Hiro is definitely one of these creators. He always updates it shortly after new game version is up and he never lets a player's request go unnoticed. I am now leaving the floor to Hiro to tell you his story in his own words. When the map builder tool for Aggressors came out, I made several maps. While playing with this new toy, I decided to make a new scenario with these maps. 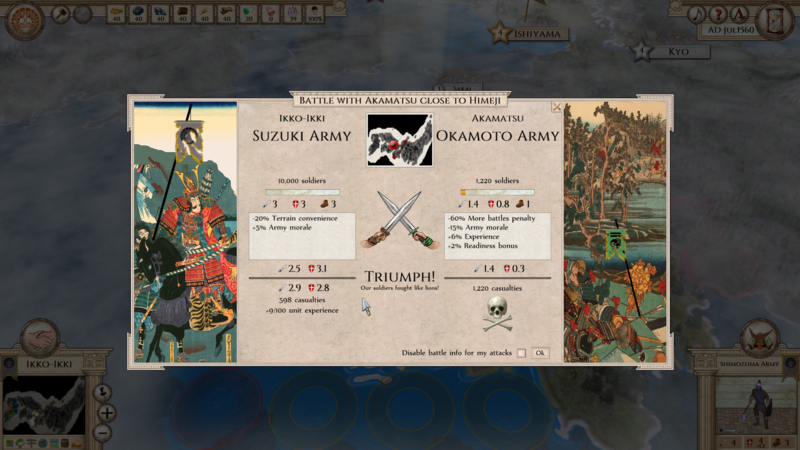 Eventually I selected two scenario candidates: one was a scenario about the Sengoku period of Japan, the other about medieval Europe, but I decided to make the former because as a native Japanese, I could more easily gather necessary materials such as flags and faction pictures for the diplomacy screen; also I wanted to make a scenario about completely new circumstances and factions. Europe was already represented in the Mediterranean main scenario and several user-created scenarios. Finally I thought the Sengoku period was more suitable for the game engine, because eventually during the Sengoku period, Japan was united by Oda/Toyotomi clan like Roman Republic did with the Mediterranean coasts. On the other hand, medieval Europe was never united by one powerful faction; consequently that scenario must be an alternative history one (to be honest I don't much care about historical persuasiveness though). For these reasons, I decided to make the Sengoku one. One of the challenges I've meet in developing the scenario/mod was gathering suitable pictures for event graphics. I chose these pictures from Ukiyoe, traditional Japanese art and several pictures of Sengoku period, but too many event graphics were required. Also testing game balance was a never-ending task. I myself am not a good strategy gamer; I usually play the game at the Noob difficulty. But the Sengoku scenario was even more difficult than the Mediterranean main scenario, so testing the scenario was (and is) very challenging. Seems like users have enjoyed my scenario/map, and send a lot of opinions, which helps further development of the scenario/mod. Also I want to make more Objectives. But all in all I've been satisfied with the current version of the scenario/mod. Perhaps I'll make a Medieval Europa version and other periods of history too. 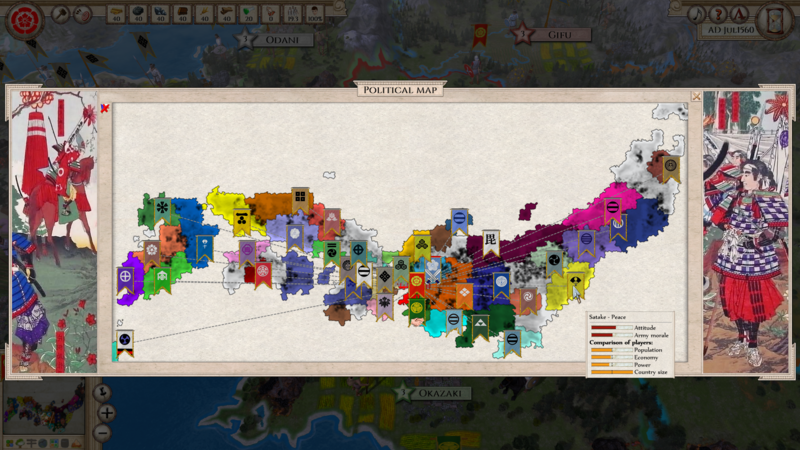 I realized while making the Sengoku scenario that this engine, especially the AIs, are excellent for these scenarios. You can subscribe to “Ancient Orient 1000BC” here and “Sengoku Japan 1560” here. Don't forget to drop a message there for Hiro once you try them. I can only stress that players' feedback (whatever it is) is always good, and especially the positive is the best motivation to keep going. Will you enable us to add our own custom units in the future? this is enabled already since vanilla release. You can create your own unit types, terrain types, buildings, unit actions, ... Basically anything.